This was not a double feature, but I did see “Ricki and the Flash.” I guess some wounds are so bad all you can do is sing a song about them. Ricki (Meryl Streep from “Into The Woods”) and her band, The Flash, have been the house band at the Salt Well for years. It’s a small joint in Los Angeles, and they usually play to about 20 or 30 regulars. She almost makes enough to cover her bar tab, so she has to keep her day job as a cashier. Ricki gets a call from her ex-husband Pete (Kevin Kline from “Last Vegas”) saying their daughter’s marriage and life is falling apart and she needs to come to Indianapolis to help her. When Ricki gets there, Julie (Mamie Gummer from “Cake”) is a mess, and she unloads a truckload of baggage on her estranged mother. Ricki struggles to be the person her daughter needs, as she barely knows how be a rock star and maybe a hip mother, but not the nurturing kind Julie or her two grown sons wanted her to be. I will admit that I got a real Cameron Crowe (“Jerry Maguire”) feeling watching this movie, and Ms. Streep, I must say, “You had me at ‘American Girl.’” This is Meryl Streep’s best musical since “Mamma Mia,” and that’s right, I am skipping over “Into The Woods.” Of course she is great in the movie, but I would like to have seen a lesser-known actress take on this role. We never forget we are watching a movie star, and the girl playing her daughter is her real life daughter. You might think this would be a story about someone who held fast to her dream and finally made it. 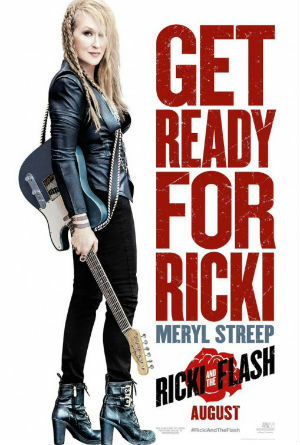 Sorry, but this is not about Ricki’s rise to stardom – it’s about her journey to accept the costs of her dream. To see and feel the pain she caused her family when she passed on being a wife and mother to be a rock star. With a decent screenplay by Diablo Cody (“Paradise”), who has lived on the edge, the story unfolded in a raw and heartwarming way. Ricki is different, and she stands out in a crowd. She’s different, and she can’t help but be the person she is. She has one more shot at being loved by her boyfriend Greg (Rick Springfield from “True Detective“), who explains a parent’s love better than anyone I have ever heard. I enjoyed watching a movie about people who had lived a life and not done everything right. People with pain that will not go away and they find out all they can do is start putting things on the other side of the scales. And for that I must give this movie 3 ½ stars out of 5. The moral of the story may be that time and classic rock music heals all wounds.